The pre-release buzz surrounding Young Tiger NTR’s ‘Ramayya Vasthavyya’ is superb and this is increasing expectations on the film. The movie is all set to release in a massive way tomorrow across the world. Director Harish Shankar says that the movie is going to release in overseas markets in a huge number of theatres. 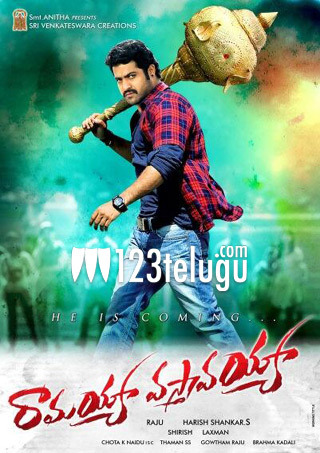 Mythri movies, the banner that tasted super success with ‘Atharintiki Daaredhi’, is distributing ‘Ramayya Vasthavayya’ in the overseas market. Apparently,they are now releasing this movie in the highest number of screens ever, for a South Indian movie in overseas territories. Meanwhile, Harish Shankar has asked the fans not to miss the introduction scene of NTR in the movie. We will have to wait till tomorrow to see what surprises Harish Shankar has in store for us. Samantha will be seen as the heroine in this movie and Shruti Haasan is playing a crucial guest role. Thaman has composed the music for this film.